Eyjafjallajökull translates to island-mountains-glacier in Icelandic, and consists of a volcano completely covered by an ice cap. It is located on the south coast, with the highest peak being 1667 meters. It is a stratovolcano, which means it is made up of many layers of hardened lava, tephra, pumice and volcanic ash. These volcanoes are characterized by their periodic and explosive eruptions. We can take you over this site that now carries a recent piece of history, don't miss out on the opportunity to see one of Iceland's many wonders from the sky! Eyjafjallajökull is probably the most famous volcano of Iceland due to its 2010 eruption. The resulting ash cloud blew over the Atlantic Ocean and passed directly over Europe for considerable intervals. Flights of most commercial aircrafts were interrupted for nearly a week causing significant economic damage. The volcano is situated in southern Iceland to the north of Skógar and to the west of Mýrdalsjökull glacier. Eyjafjallajökull is a stratovolcano covered by an ice cap with a summit elevation of 1,651 meters (5,417 ft). The southern part of the volcano once belonged to the Atlantic coastline. Apart from the most recent eruption in 2010, the volcano has erupted quite frequently since the last glacial period: in 920, 1612 and in the years from 1821 to 1823. In 1821 the eruption phase started around the 19th of December and continued over the next several days. Afterwards, the sequence of volcanic activity continued on a more attenuated level until the middle of 1822. Here, another sequence of explosive eruptions set in for about a month. Finally, it got quieter in the last months of the year. However, in early 1823, the volcano Katla located close-by under the Mýrdalsjökull ice cap erupted. The smoke was seen on the summit of Eyjafjallajökull simultaneously.The ash of the eruption in 1821 can be found all over the south of Iceland in the form of dark grey, fine-grained rock. The name Eyjafjallajökull is made up of two parts: the first part, Eyjafjöll, is the name given to the southern side of the volcanic mountain mass, which forms the foot of the volcano together with the small mountains. The name is made up of the words eyja meaning „island“ and fjöll meaning „mountains“ so the literal meaning is „the mountains of the island“. The second part, which the name is made up of is jökull means glacier. Therefore, the altogether meaning is "glacier of the islands mountain“. The eruption in 2010 lasted almost one month. 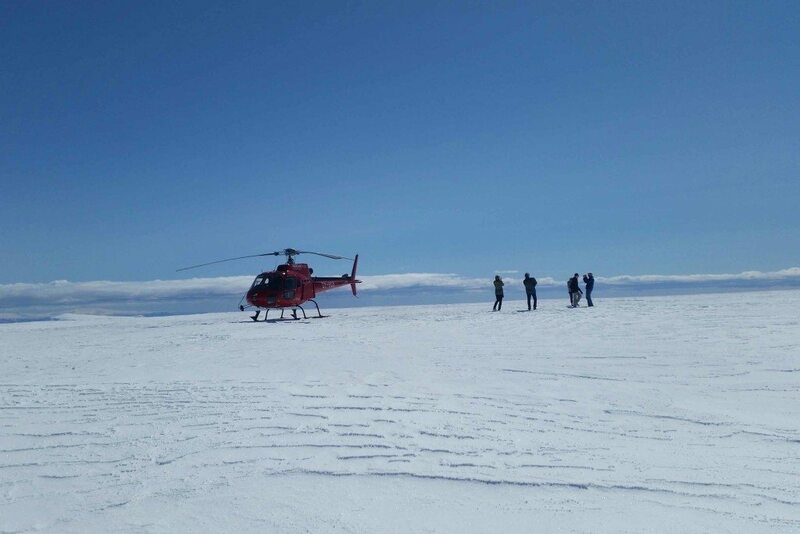 During this time, Norðurflug has implemented 10 trips a day with two helicopters. The departure took place from Hotel Ranga, which is located between Reykjavík and the volcano, approximately 95 km away from the city center. Discover Eyjafjallajökull by helicopter on the Volcanoes and Glaciers tour, the Essential Iceland tour and the Glacier Lagoon Expedition.